Homeschooling can play a big role in keeping a family together. United in their goals, working toward them together. Learning, Laughing, eating, vacationing together. There is a common misconception that homeschooled children are socially underdeveloped and lonely. Homeschooling fosters positive socializing by allowing you to control the friends your child has. It lets you establish respect for authority and the appropriate way to interact with others, including adults and other children. Let your well-disciplined children be the proof. Your children set a fine example in the community when they have fine manners and are able to speak coherently to an adult. Homeschooling prevents your children from getting conflicting messages about morality and faith. Imagine being a child and hearing at school that we evolved from other creatures or a soup and at home learning that all things were created by God including humans. Or, being taught at school conflicting morals from the ones taught at home. You could imagine the conflict in their impressionable minds. They live in two worlds, one at home and with the congregation and one at school. At school, they deal with fads, the latest movie, electronic gadget, advertising, and more. There is constant conflict between their school-life and home-life. Not all children learn the same, and homeschooling provides an educational experience unique to your child. If you have two children you will have two learning differences, if you have four children you will have four. Families are able to set their own schedule instead of being bound by the standard school year calendar. Whenever there is a convention or the Circuit Overseer is in town- you are able to be flexible and have a full share. You can vacation at a time of year when the weather is great and the crowds small. If a family emergency comes up, you are able to take a break and take care of that first. Many families are able to serve where the Need is Greater. Homeschooling allows your child to delve deep into their interests. Allow them to foster a love of learning by following their interests. Your job is to provide the needed materials and opportunities for them to do this. You never know how much time you will have with your kids (Ecc. 9:11) and therefore will never regret the time you gave to them through homeschooling and just being there for them when they need you the most. We have personal experience with this, losing our 21-year-old son this year. He still lived at home and worshipped and vacationed with us. We don’t regret a moment of homeschooling! How do you graduate your kids when you homeschool? And what about a Diploma? Is one really needed? Basically the student should get a diploma; they are going to need that for job applications and vocational schools or community college. You do not want your child viewed as a drop-out; they are not, if they have sufficiently finished High School. According to law a parent can graduate a student themselves. If you are going to do this you need to keep an excellent portfolio and write a transcript for each High School year. There are some transcript/diploma companies/schools out there to do this for you too. If you are going to do it totally on your own I would suggest at least joining Home School Legal Defense. I just found on their site they sell diplomas too (you do not have to be a member to purchase). Some parents like to finish up their home education by having their student take the GED. In the state I live it no longer says General Equivalency Diploma; it says the State's Name & then High School Diploma. As far as colleges/vocational schools go they usually give an entrance test of some sort and that is mainly what they will look at; sometimes they will ask to see the High School portfolio and/or Transcript too, so it is important to keep all 4 years. You will need to grade the work done in High School too because grades are a part of the transcript. Include too any activities on your student's transcript that they voluntarily participated in, ie. LDC, pioneering, weekly softball games with the congregation, volunteering at the local library, any farming activities, if they have mastered a musical instrument, part-time jobs, Diving Certification, Ham Radio Licence etc. "Do I need an “accredited” diploma? If so, how do I get one? Some colleges and employers look down on a homeschool diploma (they want it to be state-certified). It’s getting easier every day! Many colleges are now familiar with homeschooling in general, and most of them have already admitted homeschooled students. Some colleges even have admissions officers who specifically review homeschooled students’ applications. Record keeping is important during the high school years, so that you can provide admissions officers with an accurate account of the courses that your child has completed in high school. Most colleges require either SAT or ACT test scores for admission. Many helpful resources regarding college admission are available, as are college prep materials." The best way is to call the school you are considering and find out from admissions what they require. Enriching your Transcript/Portfolio: Dual Enrolling in community college classes, taking Vocational classes, or taking college level classes during high school can help earn value to your transcript. You can also get the adult in charge to sign a statement of your student's participation in volunteer work. Keep a copy of any certifications or licenses that your child obtains in the portfolio. If your son or daughter pioneers make a copy of the signed application and even time slips for the portfolio. Keep receipts for entrance fees when you go on a field trip. "Can you give me an example of a typical high school program? 2 years of a Foreign Language"
By going to Home School Legal Defense site you can have many questions answered about graduation. HSLDA has a transcript service. Also read this page for help with transcript writing. HSLDA has a Diploma you can purchase. Neither the Transcript or the Diploma certify completion of any course of Study. Some parents elect to go under an umbrella school that allows you to choose your own curriculum, you would inform them of the curriculum you are using, report attendance and grades to the school and when your student has met their graduation requirements, they issue a diploma. According to HSLDA this is not necessary, but, some choose to do this anyway. Go to FAQ page for a list of Umbrella Schools. Take a look. Take a long, meditating look. Breathe. Think about the long-distance results. Got confidence? You see and hear your son giving a public Bible reading in front of 100 people. He is nervous but he has composure. He reads well. He reads really well. This reading has a lot of hard names and places in it, yet, he confidently reads them with feeling. He has improved so much this past year. You can tell his anxiety level is less. He is happier. He is learning and doing all kinds of things that he simply didn’t have time to do before. You have learned a lot about him and how he learns this year. You relax your shoulders and take a deep breath as he exits the stage with a big smile on his face. The congregation claps even though this is not his first Bible reading; they all see and hear the improvements he has made this year as well. You think to yourself, “I can do this, I see the improvements, others see the improvements, the teaching is a challenge at times but, I can do this!” Got confidence? You look at your daughter as she takes the door confidently with another sister. You remember how reserved she was just a year ago. You remember all the teasing she received at school, how she was picked on and attacked on the bus. She had become so withdrawn, what happened to her childhood? Her doctors wanted to put her on medication for depression but you knew deep down that wasn’t the answer. You were scared when you thought of teaching her at home, the thoughts were overwhelming. Would I be able to do a good job? Would she succeed? Would she get better? You pull out your phone and snap a picture of that big smile on her face as she’s walking back to the car. She is so proud of herself. As she gets into the car she tells you all about the call and gets your help writing down the results. She has a confidence and happiness that you did not see just one short year ago. You smile to yourself, and you think, “I can do this.” Got confidence? You watch your teen boys as they study regularly for the meetings. You watch them enjoy doing science projects with full focus. Their thoughts unhindered by bad associates, dating, or getting high. They enjoy what they are learning and regularly tell you in full detail what they have learned. You listen intently even though what they have learned is far above your head, but they are good at explaining it so that you can understand. They could actually teach it. You smile to yourself as you think back to all the years that you homeschooled, the happy times, the field trips with the group, the challenges, the times you felt like giving up. You sigh. You are glad you didn’t give up! You are glad you didn’t listen to the nay-sayers. You have raised fine young men. Got confidence? YES! Are we really at the end of another year? Sometimes they fly by so fast it makes my head swim. Those of you who have been hard at work with educating your children are about ready for a Winter Break….and you deserve one! Being a teacher requires a lot of work and determination. I’m proud of all of you who have made the decision to educate your children and are sticking to it. Hopefully you are taking the opportunity to learn right alongside your children and experience the joys of new wonders, great stories, nature walks, and field trip adventures. Some of you may lack confidence that you really can educate your children; I assure you that you can. My last child is a senior this year! It really does take determination and stick-to-itiveness. When you learned to drive, your instructor taught you to look down the road and not right off the hood of your car. This helped you to keep your car squarely in your lane and focus on what was ahead….down the road. This is the same view you need to take with home education. Yes, some of the tedious stuff like grammar and math can make us lose focus and ‘look right off the hood of our car’ with frustration and want to give up. Don’t do that. Look at all the great things you have learned together, the time you’ve spent together……through all the hurdles and break-throughs. Do you really want to exchange that for parent-teacher conferences, waiting in the drop-off line, common-core, just-for-the-paycheck teachers, and homework? I hope not. While our kids are at home with us they can mature at the rate they need to mature at and at the grade/reading/math level they need; not the one-size-fits-all box. We can help them along, speed up when needed, or slow down when needed. Do we detect a character flaw or a spiritual need in our children? We can take the opportunity to spend time in these areas as well. These are the privileges of homeschooling. Do we have to do every problem, every worksheet, every page from every textbook every time? No, this would border on busywork. Your aim is for mastery of a concept, a level of ease at doing different functions, and maintenance. This means being able to do some sample problems successfully, after some time has passed from the initial lesson. A second aim is for a well-rounded general knowledge of the world around us and how it functions and that we can function with in it. Some of you are dreading high school, there is no real need to dread it. You’ve taught your children well, they have learned how to study. Much of what they need to learn in high school they will be able to accomplish on their own. You may need to get a tutor from time to time, but you can do this. You are their mentor and they need you now more than ever as they finish maturing in a safe environment. They need to finish out their general knowledge education and they need to be kept focusing on ‘looking down the road’ as well. Don’t let the veer off too soon; some want to drop out early, don’t allow this, make them graduate, they will be glad they did and it will help them to land a job in the future when needed. Have a great Winter Break with your family and Happy Homeschooling!! Nature study is a style of educating that searches for the principles of science in nature through nature walks, field guides, discussions, and the making of journals. Nature study awakens the scientific side of the brain in the same way that a good book can awaken the imagination. This method of study can be incorporated at any grade level on short 30 minute nature walks. Enjoy learning along with your child by means of these walks and create a lifelong desire for learning. It became a popular educational movement in the early 20th century and it is currently regaining popularity once again among homeschoolers. It helps the student to see science up-close and personal, to understand the processes going on around them everyday and to develop in them a desire to learn more. I found two blog pages that give great details on Nature Study. You can glean some ideas from these on how to incorporate this into your science studies. The second URL is based on using the book Handbook of Nature Study by Anna Comstock. Life is full of little, and sometimes not so little tragedies. It happens to all of us, that's just part of life. We get sick, we have a loved one that gets chronically ill, someone loses a job, someone breaks a bone... It happens to all of us. It's funny that the 12-month year does not fit into a 9-month schedule. Isn't it wonderful that we homeschool and you not have to always stick to the nine-month schedule? This gives us room for life's little tragedies, we can keep plugging along until we reach our goals. If you view homeschooling with a long-term goal of your child getting a great education and reaching graduation at the end, then homeschooling can become part of your life whatever life throws your way. I'm really writing this newsletter as a reminder to myself. Life happens, and sometimes it doesn’t fit into that nice calendar I made out at the beginning of the month. We recently had one of life's little tragedies; my husband had an accident and broke his collarbone and was out of work for three and a half months. He's just now getting back to work, and we are just now trying to get back into a good routine…..and now we all have a cold! Think back to Aesop's fable: The Tortoise and the Hare. Who eventually won the race? Maybe you were the hare earlier in the school year and you thought, “I got this,” and then maybe you took a break, lay back by a tree for a few weeks and enjoyed yourself. Now you find that time is getting away from you and one of life's little tragedies strikes. Thus again, it's a good thing you homeschool. If you need to you can combine a few lessons, or you can simply pick up where you left off and continue on like the tortoise. You will win the race eventually, and one day, you'll look back and be surprised that you made it to 12th grade! It does happen, believe me! Sometimes you may be dealing with an illness that is long lasting and so you have to take schooling like the tortoise, and that's okay because you'll still get there, at your own pace. You'll get to see little goals that your kids meet, like one day your child is able to read on their own and you can't keep enough books on-hand for them. You get to enjoy watching your kids appreciate creation at home and when you get to travel. And one day they know more science than you do; how did that happen? It’s all about our attitude, right? (Proverbs 24:10) Enjoy the time with your kids watch them grow up, let them learn to love learning, and face life's little tragedies together. “Ohh, I knew homeschoolers in Smallville, and they were weird!” says neighbor Bob. “Homeschoolers won’t have to face opposition,” says a well-meaning sister. Sound familiar? If you haven’t heard any comments like this yet, your day is coming! While we do live in a homeschooling friendly country, occasionally we come across a negative opinion. They come from all sorts of people, even relatives, and sometimes it comes as a shock. We may be taken aback by the rudeness of the comment or embarrassed and unsure of what to say. But instead of remaining silent and possible perpetuating the homeschool mystery, you have several options, and only you can decide how to respond. SMILE- you know your family is doing great with this decision! Let your well-disciplined children be the proof. Your children set a fine example in the community when they have fine manners and are able to speak coherently to an adult. Know your reasons for homeschooling and be willing to share them if the person is truly interested. READ- be familiar with the latest statistics or be able to direct the person to them (US DEPT. OF EDUCATION, for example). If you are feeling edgy, lay out the stats on the negative things that you are trying to avoid (violence, immorality, children passed on without truly having an education, illiteracy rates) and counter with the positive things that homeschoolers are doing (a true love of learning, reading at college levels, One-on-One tutorship, teaching children to think for themselves, above average on test scores, or news reports on National Spelling Bee & Geography winners). Read up also on homeschooling and the various methods used; as all students learn differently and at their own rate. EXPLAIN- while you appreciate and respect their right to an opinion, you too, have the right (legally) to home educate your child and you know what is best for your children and family. You can let them know that you have not made this decision lightly and have weighed the costs. WALK- away! Sometimes ‘remaining silent’ may be the best response to an outright verbal attack. Your replies will fall on deaf ears anyway. (see SMILE – your kid’s conduct (borrowing it is good) may be the proof that changes the person’s mind.) And sometimes this silent proof is seen over a period of years as your children mature and become fine citizens. In both circumstances, brevity in your answer is key. Never assume anything about the family or give out personal information, especially if you feel like the person asking is being confrontational. Another example: What do you say if………. You have a million and one responses to this! Last example: What do you say if…….. They will! They will have to answer to store clerks, music teachers, in the ministry, librarians, at the dentist office and more: “Was Santa good to you this year? Happy Birthday, Johnnie, here is a bundle of Birthday balloons for you. Why don’t you salute the flag? Do your parents make you preach?”………it will happen; be prepared, and have practice sessions with your children. “Socialization” is a huge issue for many people. It used to be hard to respond to, but that really isn’t the case anymore. Years ago, the homeschool movement was anti-system. People pulled their kids out of school and refused to report to anyone. Many well meaning people recall this time period and think that it is still a radical activity. Fortunately things have changed and kids are often involved in so many activities that calling them homeschoolers is a misnomer! They are certainly not doing all these activities alone and many of them not at home. There is no condition given in the three definitions: no age, race, or gender requirements. Nor does the definition imply that it must take place in a certain location. (i.e. school) Our children have to “act in a social manner” with all types of people: family, congregation members, librarians, zoo keepers, store clerks, and even strangers. They are ‘hobnobbing’ all over the place! And lo and behold! I bet you’ve never heard them grunt, snort, scream, or wipe their dirty hands on any of them! Yes, social faux pas are bound to happen…. Small children are curious, loudly curious to our dismay. These are opportunities for teachable moments, “social skills,” tact, good manners, and general information about the world and its people. Generally speaking, we do not isolate our children. There may be times when we aren’t as active with filed trips and other happenings, but there is probably never a time when your child isn’t ‘mixing or getting together or associating’ with someone. Our kids are cool- they are well-rounded and they are sociable, socialized, and having socialization! Are we distracted from the End Result by focusing so much on the now? It’s true that educating our own children takes lots of little tasks each and every day, tiring tasks, sometimes monotonous tasks. As the old saying goes, it might be time to “stop and smell the roses”! What End Result am I talking about, you may ask yourself. I’m talking about the big picture in the whole scheme of educating our children. What kind of adults do we want to turn out? One day, they will become adults and our job will be done. Believe it or not, it comes quicker than you think! Do we want mindless parrots who can just blurt out trivia to seem smart, or instead are we looking for a well-rounded adult? I would think that most of us would like the latter. A well rounded adult who can think for themselves, who can solve problems on their own no matter what it is, and who has a well-rounded personality and can get along with most anybody. One who can follow directions and continue to learn, but, can also take the lead and train others. One who can speak with the ability to teach others. One who has the continued desire to learn all throughout life through experience, study, travel, and relationships. No doubt many of us parents, myself as well, were educated through the public school system. Many of us were raised in the truth as well, and I can say from personal experience, that that was a big part of my education. Being on the Theocratic Ministry School most of my life, meeting preparation, and regular field ministry with various personalities all helped to round-out my own education. As parents taught the way we were in the public school system, we may tend to think that we should run our homeschool the same way. But, stop and think, isn’t that at least part of the reason that we decided to home educate was so that we could educate our children differently? Are we doing that? Or are we trying to produce cookie-cutter children? You may be saying to yourself, “Well, my Janie is not at the same level as Becky that is in Public School and they are the same age! I must be failing, I’m going to have to put her back in.” You may need to stop and consider, “What is Becky learning that my Janie isn’t learning, and that I don’t want her to learn?” There is a lot of things kids ‘learn’ in school that we may not want them to. Keep your focus parents on the End Result of your education program. Teach your children to read well and enjoy it by reading with them. They need to know math skills, and they need to write well. Provide your children with lots of resources, all different kinds of resources to promote learning. Do you have plenty of books in the house? Are your library cards well used? Are the kids watching too much TV and video games that they ‘don’t like to read’? Are we as parents so busy with our own interests that we are selling our kid’s education short? When your child expresses a particular interest in something, do they have the opportunity to explore that interest? Learning takes place all throughout our lives, not only through our formal education but through life experiences as well. We all learn and mature at different rates. I’m not saying not focus on academics, they are very important. I’m just saying, keep your focus on the End Result, work on forming the whole person; spiritually, academically, socially, common sense, the ability to think individually, the ability to study and learn any topic of interest, the ability to teach someone else, and the ability to care for others. Take time to ‘smell the roses’ and learn through experiences, relationships, places, and adventures. Allow your children some room to explore what they are interested in side by side of learning the ABCs. And then, when you are all done you will be able to see the End Result, and be proud of the adult you have raised. 12/28/14 Encouraging Response to this newsletter: As usual, I really needed that newsletter! I agree completely. I often think about my high school education and can only remember a couple of classes -out of a very long four years- that I really benefited from. Honestly, the most valuable skills were taught in elementary school, as I recall. I think about this when homeschooling my kids. They already have the fundamentals. Now we just build on them. Not at all what happens in public school. I really like how you are encouraging us to think outside of the box. So true! No comparisons should be made between public and homeschool. Apples and oranges. Thank you again for your encouragement and enlightenment! You are a wonderful and resourceful person! We thank you! Find additional information on this topic by reading: How to Nurture a Love of Learning found in Awake! Issue #1: If you live in a rural area like myself and have relatives that live next door you may have a problem on your hands when it comes to homeschooling. Relatives & close neighbors often feel that if the kids are home they can help out with this and that chores, which is fine in perspective, and at the appropriate time, aka- after school. Have you run into problems with this? If so, you are not alone. Issue #2: What about other issues like endless interrupting phone calls, doctor’s appointments, errands, etc.? How can we ever get onto a schedule that works without interruptions? While there will always be interruptions of one sort or the other in life; we can try and put our school schedule on top priority. Once you have worked out the ideal school schedule you will want to stick to it as much as possible. But, just remember life is full of twists and turns and be willing to adjust. You may have to make up some days in the summer, or you might have to have a few night classes to get caught up, but, we want this to be the exception rather than the rule. Solution for Issue #1: Gently explain to nearby relatives and neighbors that you are homeschooling your children and it is a legal requirement that they be in attendance during school and for so many hours per day. They could greatly help you out by refraining from calling or visiting or asking for help during your school schedule; say between 8 am- 2 pm M-F (or whatever your schedule is). Explain that you need the uninterrupted time with them in order to teach and answer questions so that they can learn in an orderly manner. You might also mention that if your kids had gotten on a bus that morning and went to school, they wouldn’t be home until 4 pm with homework. Once you have explained this clearly but nicely to them, stick to it. I’ve had to stop answering the phone between 8am- 2 pm. I’ve had to come to the door with my teacher’s manual and red pen in hand and let them know I’ll have to get back to them in the afternoon (borrowing its not an emergency). My friend mentioned above has had to post a sign on her door during school hours and lock it. Solution for Issue #2: Phone calls- if you have caller ID you can see who it is before answering, if not don’t answer it, let your husband know to call you on your cell so you know to answer it. I only make doctor’s appointments for afternoons or non-school days. If you have a bunch to do, try and schedule them all in one or two days and just take those days off of school or take along something light. Errands too will have to wait until the afternoon, or do them first thing early in the morning and then start school. If you always allow interruptions then you will continue to struggle to be successful in homeschooling. Have your children always been in public school and you have just recently decided to homeschool? Then this newsletter is for you. Depending on how long your child has been in the school system, and how devastated they are from the experience, take several weeks to several months off from doing anything remotely resembling school activities. If your child has had problems in school such as bullying, or test stress, it’s particularly important to take time to relax together as a family, to read, to discuss issues, to talk about goals, and to think about what education means to you and your family. Children in school have been programmed to learn via force-feeding. This causes kids to hate learning. In the homeschooling world we are hoping to direct our kids into a love of learning. We are learning things every day from interacting with other people of all ages, using math while shopping, our ministry, the news, nature walks, discussions, and so much more. By taking some time off with your kids and watch what they learn and how they learn, you will be learning too. You will see how they learn best, you will see what their interests are, this will help you to guide them on their path of education. You will find that homeschooling/learning just becomes part of who you are, a part of what you do every day, it is not just a set number of hours of your life- LIFE is LEARNING! After you have taken this hiatus you will begin to relax with homeschooling and allow much of your learning to be interest led. You will find that homeschooling methods are quite different from the way you learned if you went to a school yourself. You will need to de-school too. Everything does not have to be tested or micromanaged. If your child is given the chance to learn what he/she would like to learn; what would they choose to learn about? You may have a child who would be an awesome artist if he had the time to pursue it. Would your child write a novel? Perhaps they would build a robot and program it. Or maybe research rocketry and build his own rockets. You will never know if you don't give them the chance to explore what they are interested in. We have had the privilege to experience learning like this- and someday, you will too! ﻿WHAT DO ALL OF THESE FAMOUS PEOPLE HAVE IN COMMON? In doing research for this newsletter I found that there is controversy over this very question on the internet. Parents who have their children in public or private school state that parents are not qualified to teach their children unless they have a teaching certificate. Parents who homeschool state that they are more qualified than anyone else to teach their children; they are their first teachers and know their children best. Parents, if you have made the decision to teach your children then you have thought these things through. Hopefully you were a good student yourself while in school. Take the time to do some research and train yourselves as well. As parents we not only have the obligation to teach our children but to train them to teach themselves. We want life-long learners. Teach them how to think; discuss what they are learning and current events. Teach them common sense. Teach them how to do research and have good study habits. Let them see you reading, and doing research. As parents, we are also providers; so, provide your children with interesting materials to read and study, at times you may need to seek the help of a tutor. By using quality materials written for homeschool use most parents have found that they can teach their children at home. We find that we have been learning right along side of them all along. Many times by training our children how to teach themselves, we find that they surpass us in their knowledge of Science, Math, Literature, and History as they become young men and women. So, parents, are you qualified to teach your own children? You can be! Learn alongside your children, get help when needed, and enjoy this precious time together! A number of years ago my husband came home from work to find me crying outside. I had hit burnout. Both boys were young and I just seemed overwhelmed. My friend and I were the main ones homeschooling here at the time and the group we tried to form did not always get the support it needed. Often I felt I was doing this all on my own. And yet, I knew I was doing what was best for my kids. They never went to pre-school or public school, and yet, my husband says, "Well, if this is getting to be too much, maybe it is time to put them in school." At that moment I felt relief, but after not sleeping all night I got up and said I can't do it, I can't put them in public school. So my friend, came up with this newsletter and supported me through. We went on to help others continue on their journey. To this day, I believe we made the right choice, and have succeeded beyond our imaginations. *Am I too worn out at the end of the day? *Have I lost my enthusiasm and joy in home schooling? *Am I easily irritated or feeling ill more often? If there are no obvious reasons for your feelings, then burnout may have struck! You may manage for awhile, squeak by with your schedule, get some work accomplished. But there are ways to get past it. Make sure your spouse is aware that you are having a bit of difficulty in the education department (and yet, explain to him that you do not want to give up; you just need support), get enough sleep, avoid caffeine if it seems to be a problem, and especially, build in some recovery time into your schedule. Having a productive school day that has a beginning and an end helps too. Recovery time could include personal time, spouse time, or taking the school day off. This may include removing excess responsibilities or running around. Schedule doctor's and dentist's appointments in the afternoons so that your school day is not constantly interrupted. You may have to in a kind manner let your friends and family know that between 8am-1pm the kids are in school; not having interruptions is a way that they can assist you to accomplish your goal. Try changing your schedule, I suggest schooling only 4 days a week, this is important for yourself and for your kids. Some families work 6 weeks on and then take one week off; this gives you all something to look forward to. Plan some relaxing short vacations or day trips; trips are educational and can be counted as a school day- but, oh, so relaxing. How about a month of auxiliary pioneering with only a few school days during the month (days in-between service). This gives everyone a change in pace; but again, still educational. When your kids reach upper middle school/High School after you have spent years reading aloud to them, teaching them how to study, and a love of learning; you will see them teaching themselves even things you do not understand then you will see your success as a Home Teacher, and you will be proud. Homeschooling works, but only if you are doing it happily! Both old and new homeschoolers have occasionally suffered burnout, a few minor changes may be all it takes to keep you going! - Please see g95 1/8 on "Burnout- How Can You Cope?/ Twelve Ways to Prevent Burnout"
Why Reading Aloud is Good for Your Children.... And You! adapted from "A Survivors' Guide to Homeschooling"
Most children love being read to, and experience has proved that read-to children grow up to be readers. But did you realize that reading aloud has an even more fundamental effect? What happens inside a child's head when he is listening to a story? The words he receives through his ears are converted to mental images. He is processing entire groups of words that come in a continued flow as the story is being read. He is listening to the readers inflections and tone of voice so that he can make sense of the words. His imagination is creating an unfolding picture, using whatever information he already has about the things described in the story. His imagination does more- it fills in the details that the reader didn't read. This "listening comprehension" is essential to reading comprehension. Picture books are wonderful for pre-readers, the pictures give visual clues as to what's happening in the story. But older children and new readers need to listen to books that use very few visual clues. The facts of the story should come from the words and the details should be filled in from the imagination. A book with few pictures like a chapter book, trains a child to integrate what you are currently reading with what he remembers from the last chapter that you read. This helps build long-term memory which will serve him all his life. If a child has been read to, he has acquired many of the comprehension skills necessary to create the words into mental images. In reading, basically the same thing happens, except the words are entering through the eyes, not the ears. Compare this to watching television. When someone is watching t.v. they are "there," they have visual clues handed to them: scenery, action, and characters. They comprehend the story because it's coming directly through their primary senses. They didn't have to imagine any of the details. Now when we read, the words represent the sounds, smells, sights, and experiences that we know from real life; then our imagination kicks in and the whole picture unfolds. This takes a certain amount of attentive effort, more than watching it happen on t.v. But, what a reward the effort reaps! Effort also goes into teaching reading. Often, a child with reading problems has his first real encounter with books when he was learning to read. Not only was he then faced with the decoding, but then he had to learn to put groups of words together to form that mental picture of the story. Without it, his comprehension is diminished. Sometimes we haven't read a lot to our children because of our own reading deficiencies. But on both counts, don't worry! It's never too late to be a better reader,or listener! No matter what you choose to read aloud, be sure to remove all distractions. Give it your full attention and make sure your child gives theirs too. (No loud background music, t.v., or toys to play with.) Whatever makes your time special (cozy blankets, dimmed lights, etc.) adds to the pleasures associated with reading. Read with expression, change the character voices, and so on. And don't forget, even older children can still be read to. Your goal is to get the kids reading for themselves, so don't forget to let them read to you too! "Why do I need grammar?" Correct: "Truly I tell you today, you will be with me in Paradise." Incorrect: "Truly I tell you, today you will be with me in Paradise." 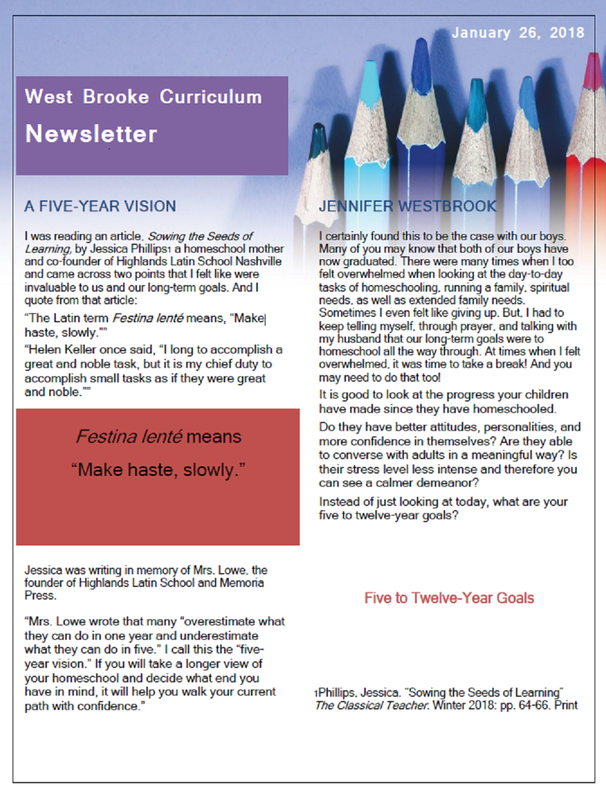 I am writing this newsletter in response to several inquiries I have had from frustrated and concerned parents. 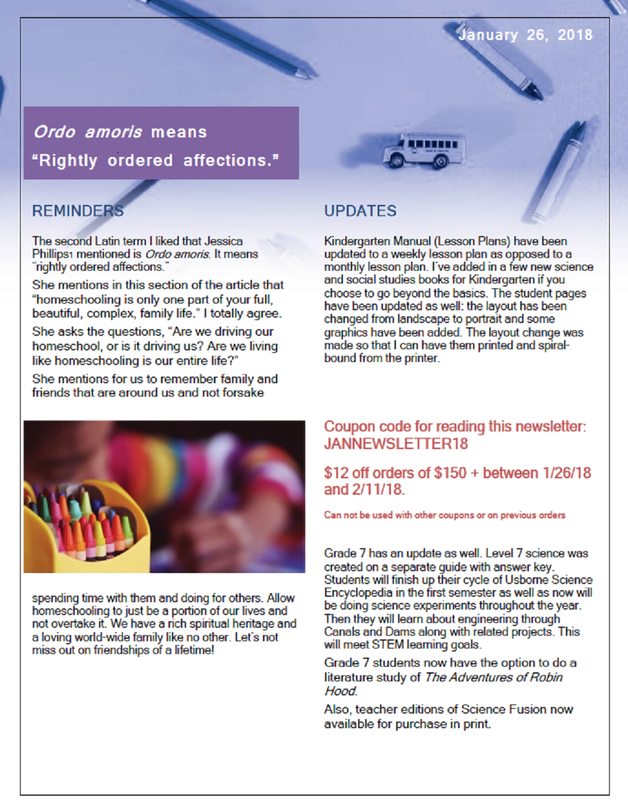 The purpose of this newsletter is to inform so that you can make wise decisions for your child's education. Every parent has the right to decide how and where to educate their children. We all have reasons for homeschooling, we might have concerns over association and drug problems in the schools, over what is being taught in schools today, we may have children with health issues that require a curriculum that is catered to them, we may wish to enjoy learning alongside our children. They grow up oh so quickly and this time spent one on one with them will pass by before you know it. Families do not operate like schools, we are not an institution. Homeschooling should just be a part of the way we live, we are learning all of the time and it takes on many forms. Children learn better when they are able to pursue what interests them; adults the same way. If what you are doing is not working take a break, try something new. Homeschooling- The education of one's children at home by the parent. The parent has complete control over what is taught, where, and when. All curriculum is chosen by the parent(s) to meet the needs of each child. Homeschooling is legal throughout Europe, Australia, New Zealand, North America, Hong Kong, and South Africa. Homeschooling is most popular in Canada, France, the United Kingdom, and the United States. Homeschooling is legally accepted in all 50 states of the U.S., but each state has its own laws that a family must adhere to. There is an estimated 1.5 to 2 million homeschoolers in this country. There are many methods of homeschooling from Unschooling to Classical to Charlotte Mason to Traditional. Homeschooling allows for the freedom to educate during hours as well as months that you choose to teach your children. In many states, you are allowed to follow any schedule that suits your family; this allows for the freedom to spend extra time in the ministry as well as pursue learning what your child is actually interested in learning. It also allows for the flexibility to educate your children in a Christian manner, choosing curriculum that suits your needs and adjusting it as needed; as well as choosing suitable literature to read. Public School at Home- The education of one's child at home through the use of a charter school or a state virtual school. All curriculum is chosen by the state; some charter schools allow the purchase of your own choice of curriculum. The public school system encourages parents to use this free resource to educate their children. They provide the education through the use of the internet and sometimes books, in many programs students are required to follow the schedule of the school system on a daily and yearly basis. Students are often required to take state tests. Every student is different and one size does not fit all. Some do well with this type of program, others do not. Are there any drawbacks to public school at home? Some parents choose this program of education because they feel they are unable to educate their children on their own, some feel like they have no other choice than to follow what their county encourages them to do. If you have had your children in public school and decide to educate them at home you may have to face this. If you have never home educated and call your school district more than likely this is the direction they will point you in. And let's face it, the lure of the word "free" entices all of us. But, what exactly will this cost us? Several parents that have contacted me are frustrated over the time involved in these types of programs. Some spending 5 hours out of one day doing just Language Arts or Math. Some were frustrated with not being able to adjust what is being taught or what their child is required to read. Some parents were concerned because their children were really having a tough time keeping up with the schedule. Notice this comment from HSLDA, "Of course, they will tell you that you can “supplement.” But the demands of the mandatory curriculum may swallow up the time and energy of many a well-intentioned parent who told himself he would supplement." Ask yourself, is there time left in my child's school day to prepare for the meeting? Are we able to get into the ministry as much as we would like? Is there time left in our school day for our children to pursue learning something they really would like to such as music, computers, art, auto- mechanics, animal husbandry, etc? Thank you M.T. for your input on this newsletter. "The CCSS by themselves are not necessarily controversial. They’re similar in certain respects to other state curriculum content standards for public schools. However, HSLDA believes that children—whether homeschooled, private schooled, or public schooled—do best when parents are fully engaged. And parents are most engaged when they know that they are in charge of their child’s education. Top-down, centralized education policy does not encourage parents to be engaged. The CCSS moves education standards from the purview of state and local control to being controlled by unaccountable education policy experts sitting in a board room far removed from the parents, students, and teachers who are most critical to a child’s educational success. Will the CCSS Affect Homeschools? The CCSS specifically do not apply to private schools or homeschools, unless they receive government dollars (online charter school programs have no such protection). However, HSLDA has serious concerns with the rush to adopt the CCSS. HSLDA has fought national education standards for the past two decades. Why? National standards lead to national curriculum and national tests, and subsequent pressure on homeschool students to be taught from the same curricula." update Feb. 2014- parents, I recommend you do some research on this topic. It is scary what their final intentions are. When is the last time you went on an "adventure" with your child? Discovered new lands, people, and cultures? How about a science fact you never learned in school, or have long forgotten? If this is daily part of your school days; you are in pretty good shape. But, on the other hand, if your day is only full of filling in blanks in 4 to 5 different workbooks, and grading endless pages of these workbooks; something is wrong with the picture. How much of this "fill-in" the blank education is really being used on a daily basis? And is this what homeschooling is all about? Some think so; they are filling a requirement for their child's grade level. The next day, week, or month does he ever talk about what he learned in those workbooks? Usually not. They will discuss some cool new fact they picked up from looking through that book about dinosaurs....... or reptiles, etc. Or perhaps, they get a thrill of retelling you that last kid mystery they just finished and what a cool ending it had! The movement of homeschooling has taken place for many reasons; one of them is that some parents felt like they could give their children a better education then they were receiving in school. Are we? The idea is to develop a love of learning in your children that will last a life-time! Do they see you reading? When they have a question that you cannot answer; do they see you walk over to that set of encyclopedias (you paid good money for) and look up the answer, show them the pictures and then read them the answer? Afterwards, you have such a lively discussion on the topic because it is something they wanted to know about, or do you say, "that will be covered in workbook so-and-so in 6 weeks." If your children see where you go to find answers (bound volumes and WT CD Rom included) they will eventually copy you- now it may take years for this action to take place, but it will! Most of you have a set allotted time that you do school, during this allotted time is 1/3 of it spent reading? Is some of the time spent reading? If so, GOOD. And I'm not just talking about your child reading his/her lesson, I'm talking about you reading to them. Whether it is science, history, a biography, a good story, a tall tale, a current event; all of these are good and will encourage your child to develop a love of learning and a love for reading. Now, I'm not saying all workbooks are bad; they all have their place, but, it should not be your sole method of teaching. Do I use workbooks? Definitely! They are a necessity for many subjects (math and grammar for example). Should they be used for each and every subject each and every day? No. What can I do for the other subjects without a workbook? You may have heard of the Charlotte Mason (1842- 1923) method; if not, do some research. Basically, she taught using whole books: biographies, nature books, true stories, poetry books, well written literature (the whole book, not literature textbooks like we were used to in school). She would cover each subject each day reading a portion of each book to the class (mixed ages). They would have discussions. Then what? After listening and discussing, each child would recite back to the teacher what they personally learned from the reading. This is called narration, start with your youngest child, then the older ones can build on that. Occasionally you would dictate a passage of importance to your capable children for them to write (or perhaps a vocabulary word); even just a short sentence for a small child. They may also copy a passage that has been highlighted. Sometimes you can record your child's narration onto a tape (this works good for stories they have made up too). This method can also be used with a good science textbook, or a good history reader that you like. Many times I also have the children draw and label (as many of the parts as their age can handle) pictures of what they learned about; for example: the inside of a seed or egg or cell, a Conestoga wagon with tools. Write difficult words for them to spell on the board before they start their dictations or labeling. This may take a little of your time however, you will reap the rewards in the long-run. You will find after much reading aloud to your children, they will have no problems with reading comprehension, vocabulary, settings, story order, etc.- all those things that they try to rip apart into little bitty pieces in a workbook. Read good, long stories (some take months to complete) to your children as well, this will develop that love of getting into a book and being glued to it for hours. They want to find out what happens next! If you do not ever do this with your children you will find that they may never really get into reading longer books. Their attention spans will be short because that is the way they are used to being fed information. When can I fit all of this in????? First of all, don't be afraid if you don't finish all of the blanks in that workbook by the end of the year! Next, we can incorporate reading time into the morning schedule, we usually do this first thing, the kids are not ready to write, they just want to listen (I find that if we don't do it first, it usually doesn't get done). We use the audio at jw.org, the lesson for the meeting, a good book, a biography, or a book related to science or history. Do we use all of these every day? No, I have a schedule for the Bible part, and mix up the rest. We usually devote 1 hour to this reading time (part of this to be broken into silent reading time for older children). Some days if mom doesn't have the time due to some other pressing matter, make it a silent reading day (but not every day). You can also fit in 10-15 minutes during the lunch break. I always eat faster than the boys, and so, sometimes I read aloud to them at this time. After dinner for 15-20 minutes on non-meeting nights might also fit in well with your schedule, and of course there is always that bed-time story (a good silent reading time too). Not all reading has to be school related. Children need to be able to read books just for fun (with no book report attached). You could also make up a "Reading Week" or "Bound Volume Day," you know one of those weeks where you just can't seem to get around to a lot of school work, or when everyone just needs a break from the regular routine. Make sure these just for fun books are meeting the child's level or under to avoid frustration. When reading aloud to them, material can be more difficult because it leads to discussions & increased vocabulary; but for their own reading, it needs to be non-threatening. What do you think your evaluator would rather see? A stack of fill-in-the-blank workbooks all filled out or a portfolio full of labeled drawings by your child, well-written quotations, made up stories and poems, art connected to things learned, photographs of projects built by hand, and your child dressed up in a historical character costume? When your evaluator sees these things in the portfolio and asks your child what they learned about, they will remember something, however, if they look at a worksheet done 6 months ago, well, they just might not remember doing it at all. Please develop a love of READING and LEARNING in your children. Cheaper by the Dozen by Frank Gilbreth, Jr.